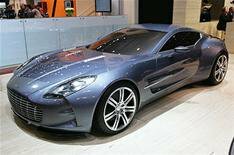 Aston Martin One-77 | What Car? Aston Martin continues to tease out the information on its 1.2 million One-77 supercar. In Geneva it has unveiled a cut away version of the two-seater sports coupe's chassis, designed, the company says, to show that the car will be as striking beneath the skin as it is in the metal. It reveals a 7.3-litre V12 engine that is mounted lower than in any other Aston Martin to push down the car's centre of gravity and aid handling. The engine is derived from the 6.0-litre V12 currently sold in the DBS, DB9 and V12 Vantage, and is being developed by tuning experts Cosworth. An extensive weight-saving programme means it is 25% lighter than the standard unit, and engineers say it will produce in excess of 700bhp and 553lb ft of pulling power. The engine is linked to a six-speed gearbox that is controlled via steering wheel-mounted paddles. The 0-60mph time is expected to be around 3.5sec, while the car will have a top speed of 200mph. The car's total weight is expected to be around 1500kg, Aerodynamic downforce will be possible to aid road-holding via a rear spoiler that can activate at higher speeds. Aston says that the chassis is derived from the DTM German touring car series, which is based around front-engined, rear-wheel-drive cars. The car is built around a lightweight carbonfibre monocoque, and features a race car-derived suspension layout. This is enhanced by dampers that can have their shock absorbing characteristics changed according to a driver's preference. Aston Martin says it will tailor these settings to an owner's requirements following delivery of the car, and that they can be adapted to suit a long-distance GT car or thoroughbred racer. The One-77 is limited to 77 cars, and will be available in right- and left-hand-drive specification.